These pages will be updated shortly. Please go to our distributor, Notocord’s webpages for iPRECIO Dual Information. 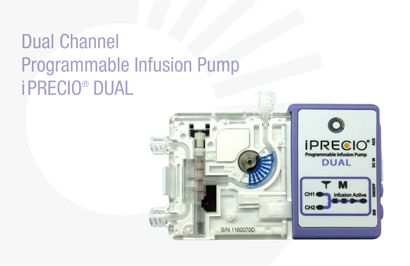 The iPRECIO® Dual is the world's first dual inlet ambulatory infusion pump. Dual reservoirs for 2 test articles or 1 test article and 1 physiological saline. It will use Orchesta®s pump transceiver module, for wireless programming, control and monitoring. This innovative designed iPRECIO® Dual will allow extremely sensitive safety pharmacology studies to be carried out remotely without any interaction with the animals from several hours pre- dose to 20/24 hours post-dose. It will no longer be necessary to enter the animal room to remove the pump and extract remaining test article from the animal’s internal catheter until the end of the physiological measurements. With IEEE 802.15.4 Orchesta® control, the pumps may also be activated manually and thus ensuring that good physiological conditions are obtained before starting the Bolus Injection procedure remotely. The dual channel infusion pump would initially infuse physiological saline to ensure good patency of catheter and to keep vein open (KVO)/maintainance(MA). The second reservoir would contain the test article.